Over Labor Day weekend in 2014, Ben and I were heading south. Actually, heading into THE South. We were on our way to Virginia to visit my uncle Mark, who does Civil War archaeology and who has an enormous collection of artifacts he has found over the years. I was on another Civil War history kick and couldn't watch enough documentaries or read enough books on the subject, so I was hugely excited to see Uncle Mark's museum. Once for Christmas, when I was 12 or 13, he sent me a box full of real Civil War bullets, and I'll never forget how much that impressed me. In fact, on my second date with Ben I brought them in my purse to impress him, and he still laughs remembering me pulling historic artifacts out of my purse at the restaurant. Is that not normal date behavior? Uncle Mark explains the Civil War artifacts to me. The first thing that we learned was that Virginia in August is painfully hot and humid. We spent the entire first night looking through crate after crate of Civil War artifacts, asking my uncle to tell us about every piece. He is a human encyclopedia of the Civil War and knew immediately what every scrap was, where he found it, and what it was used for. There were thousands of items ranging from bullets and artillery shells to buttons, eyeglass rims, and belt buckles. Most of it isn't in good enough condition for museums to take, but he still has them all tagged and catalogued because, after all, he is an archaeologist. He taught Ben and I a lot. I never knew that such advanced weapon technology was used during the Civil War (which took place during the years of 1861-1865). They had exploding land mines with timers that could be set to detonate on second impact, diabolical grapeshot, submarines, and exploding bullets, to name a few. It was so amazing to see the actual remnants of the past, to be able to touch them, and it made the past come alive so much more vividly than any book ever could. Out in the tobacco fields looking for arrowheads! 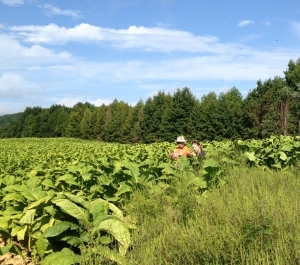 The next day, Uncle Mark took us to several huge, open tobacco fields to look for arrowheads. He is friends with a lot of the landowners in the area and they give him permission to walk their fields and look for Native American artifacts. Those fields have been plowed and worked over for such a long period of time that any artifacts that are still there have long ago lost their archaeological context (remains of a campsite, for example), so it's not violating scientific principles to pick them up. We spent hours in those fields, sweating profusely in the 100 degree heat and humidity, but loving every minute of it. I found four or five arrowheads (some of them broken) the first day before Ben or Uncle Mark found any, and they sullenly and half-jokingly told me I had to walk home from the fields. Lucky for me they each found a few pieces later in the day, so I was allowed back in the car at the end of the day. 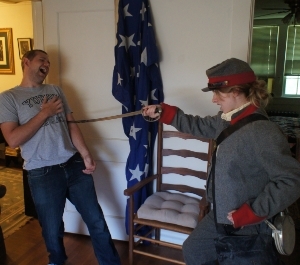 Uncle Mark occasionally participates in Civil War reenactments and kindly let Ben and me try on his Confederate soldier's uniform. It didn't fit either of us properly, but we made it work and when it was my turn, Ben considerately let me run him through with a sword for the sake of a picture. We then went through boxes of old family documents and photographs (including tin types from the 1800's), learning more about my family history. I had ancestors that fought on both sides of the Civil War, and one of them was imprisoned in Andersonville and we have his diary!!! It really made me feel more connected to that side of my family and sated my Civil War obsession in a personal way. 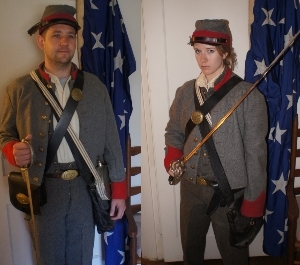 Ben and I dressed as Civil War soldiers. Me running Ben through with a sword. Overall, it was an incredible trip, both historically, personally, and culturally. It was fascinating to observe the marks left on the South by the Civil War and to learn more about how economics and shared memory affect race relations there, which is so different from the North (or the Midwest). It was so fun to be with loved ones, especially when we laughed so hard we were crying and our stomachs hurt. It was like we were teenagers again. More than anything it was really amazing to have a place to go where I can come face to face with that part of history, especially a great deal of it is my own family history.